Plano gynecologist and pregnancy doctor Dr. Baghdassarian joins the Women’s Specialists of Plano team delivering compassionate, comprehensive OBGYN care to patients in Plano, Frisco and Dallas, Texas. “Women are the nucleus of each and every family, thus their health and welfare is of utmost importance," said Dr. Baghdassarian. Drs. Jules Monier, Elizabeth Coronado, Quyen Dang and Shuchi Desai welcome Dr. David Baghdassarian to the Women’s Specialists of Plano team serving patients in the Plano, Frisco and Dallas, Texas communities. 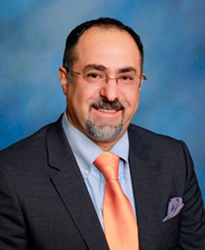 Board certified in obstetrics and gynecology, Dr. Baghdassarian approaches each patient’s health as a partnership and is deeply committed to listening to his patients in order to provide the best possible medical care. Dr. Baghdassarian relocated from Bellevue, Washington in order to be closer to his wife’s family. Serving as a pregnancy doctor and Plano gynecologist, Dr. Baghdassarian provides care to women in all stages of life, including prenatal care, preventive care, menopause management and urinary incontinency. He also specializes in advanced minimally invasive, robotic and pelvic reconstructive surgery. In addition to English, Dr. Baghdassarian is also fluent in French. Dr. Baghdassarian received his medical degree from Saba University School of Medicine in the Netherlands-Antilles and completed his residency in obstetrics and gynecology at New York Medical College. After he completed his residency, Dr. Baghdassarian began his practice at the University of Washington (UW) Medicine as an OBGYN in 2012. During his time there, he was awarded the UW Praise Award for his outstanding patient satisfaction rating and excellence in patient care. Women’s Specialists of Plano (WSOP) is a full service obstetrician-gynecologist practice that focuses on providing care from adolescent gynecology to menopause treatment for women in Plano, Frisco and North Dallas. The team of Plano OBGYN physicians and pregnancy doctors at WSOP strive to provide the most innovative treatment options to patients in North Texas. The Plano gynecologists at WSOP provide comprehensive obstetrics and gynecology services including minimally invasive surgical treatment such as da Vinci Robotic Surgery, a full range of laparoscopic and hysteroscopic procedures and in-office edometiral ablation.